Diabetic nephropathy is one of major complications of diabetes mellitus. Although chromium is an essential element for carbohydrate and lipid metabolism, its effects on diabetic nephropathy are not well understood. The present study was conducted to investigate the effects of chromium picolinate (CrPic) and chromium histidinate (CrHis) on nuclear factor-kappa B (NF-κB) and nuclear factor-E2-related factor-2 (Nrf2) pathway in the rat kidney. Male Wistar rats were divided into six groups. Group I received a standard diet (8% fat) and served as a control; Group II was fed with a standard diet and received CrPic; Group III was fed with a standard diet and received CrHis; Group IV received a high fat diet (HFD, 40% fat) for 2 weeks and then were injected with streptozotocin (STZ) (HFD/STZ); Group V was treated as group IV (HFD/STZ) but supplemented with CrPic for 12 weeks. Group VI was treated as group IV (HFD/STZ) but supplemented with CrHis. The increased NF-κβ p65 in the HFD/STZ group was inhibited by CrPic and CrHis supplementation (P < 0.05). In STZ-treated rats, a significant decrease in levels of nuclear factor of kappa light polypeptide gene enhancer in B-cells inhibitor, alpha (IκBα) was found in kidney tissues when compared to control rats (P < 0.05). A significant increase in the levels of IκBα was observed in CrPic- and CrHis-treated rats when compared with STZ-treated rats. Renal Nrf2 levels were significantly decreased in diabetic rats compared with the control rats. There was a higher tendency for increase of kidney Nrf2 level and decrease in kidney NFκBp65 levels and 4- hydroxyl nonenal (4-HNE) protein adducts (P < 0.05) in diabetic rats. Our result show that in kidney tissue CrHis/CrPic increases Nrf2 level, parallelly decreases NF-κB and partially restores IκBα levels in HFD/STZ group, suggesting that CrPic and CrHis may play a role in antioxidant defense system via the Nrf2 pathway by reducing inflammation through NF-κβ p65 inhibition. Moreover, a greater reduction in NF-κB expression and greater increases in expressions of IκBα and Nrf2 in diabetic rats supplemented with CrHis than rats supplemented with CrPic suggest that CrHis has more favorable effects than CrPic. Nutrition plays an important role in the development and also in the prevention of cancer, cardiovascular diseases, and diabetes. A high-fat diet can induce obesity and metabolic disorders, insulin resistance, dyslipidemia, and hypertension in rodents and in humans [1–3]. High-fat diets (HFD) may induce changes not only in energy metabolism but also in liver, kidney and brain function. Diabetes mellitus, a well-known endocrine metabolic disorder, is disease characterized by high levels of blood glucose and multiple tissue complications, resulting in nephropathy, neuropathy and retinopathy . Oxidative stress and disrupted redox regulation play an important role in the pathogenesis of diabetes and one of the major complications is renal and, in addition to cerebrovascular and ocular complications [5–8]. The production of tumor necrosis factor (TNF)-α and expression of nuclear transcription factor kappa B (NFκB) can be stimulated by over production of reactive oxygen species (ROS) . Inflammatory proteins may also participate in the pathogenesis of insulin resistance and its complications  and therefore, mechanisms by which insulin resistance occurs are explained by excessive activities in the NFκB pathway and of inflammatory cytokines [11–13]. Activated the inhibitor of NF-κB kinase (IKK), caused by cytokines, hyperglycemia and elevated free fatty acids (FFAs), results in the nuclear factor of kappa light polypeptide gene enhancer in B-cells inhibitor, alpha (IκBα) polyubiquitination and proteosomal degradation, and subsequent release of NFκB, especially p50/p65, to the nucleus where it can bind to the response element of target genes involved in the inflammatory response [14–16]. In return sustained activation of NFκB caused by overexpression of IKK in the liver leads to insulin resistance . Some strategies to alleviate insulin resistance by nutritional supplements appear to improve insulin sensitivity in many individuals and improve glycemic control in diabetics . Chromium (Cr) is required for normal carbohydrate, protein and lipid metabolism and its deficiency has been implicated as one of the causes of diabetes mellitus [18–20]. Supplementations of available Cr chelates with picolinic acid (CrPic) [21, 22] and histidinate (CrHis)  have been shown to exert beneficial effects for the management of type-2 diabetes, as reflected by a decline in insulin response. Several studies reported that CrPic and CrHis may enhance insulin receptor binding , increase the number of insulin receptors  and insulin receptor phosphorylation , resulting in the reduction of insulin resistance in peripheral tissues . One of the intracellular proteins influencing the insulin receptor is the oligopeptide low molecular weight chromium binding substance (LMWCr, apochromodulin) which is widely distributed in the liver, kidneys, spleen, intestine, testicles and brain [28, 29]. This peptide, which activates tyrosine kinase, depends on Cr concentration and promotes insulin receptor activity. Although numerous studies have been published examining the health aspects of chromium on humans and animals, there have been scarce studies to investigate the effects of CrHis on the IκB/NF-κB pathway or Nrf2 response in diabetic nephropathy. Therefore, the current study was performed to investigate the effect of CrHis/CrPic supplementation on changes in IκB/NF-κB pathway and Nrf2 levels in the diabetic nephropathy. Male Wistar rats (n = 90, 8 wk-old) weighing 200-250 gr were purchased from Firat University Laboratory Animal Research Center (Elazig, Turkey). These animals were reared at the temperature of 22 ± 2°C, humidity of 55 ± 5%, and with a 12/12 h light/dark cycle. The experiment was conducted under the protocol approved by the Ethical Committee of Firat University. All procedures involving rats were conducted in strict compliance with relevant laws, the Animal Welfare Act, Public Health Services Policy, and guidelines established by the Institutional Animal Care and Use Committee of the University. Rats consumed a standard diet and tap water ad libitum. Blood samples were collected from the tail vein of each rat for the measurement of biochemical efficacy markers. Rats were randomly assigned to treatment groups. The rats were fed with standard (control) diet (8% fat) or high fat diet (HFD) containing 40% fat for 12 weeks, and administered with either levels of CrPic and CrHis (Nutrition 21, Inc. NY, USA). Ingredients and chemical composition of the basal (control) diet are shown in Table 1. The diets were stored at 4°C cold chamber. Animals were fed either with a normal diet consisting of 8% fat or a HFD consisting of 40% fat. CrPic and CrHis (Nutrition 21, Inc., Purchase, NY, USA) were dissolved in water and administered at a concentration of 22 μg CrPic and CrHis were delivered via drinking water for 12 weeks (providing 8 mcg Cr/day), which is an equivalent dose of 560 μg Cr for a 70 kg adult human. A rat model of type-2 diabetes which was created by feeding with a HFD and STZ treatment, developed by Reed et al. . This model provides a novel animal model for type-2 diabetes that is applicable to the human syndrome making it suitable for testing antidiabetic compounds. In using such a model, the increased hyperglycemia after STZ injection in high-fat fed rats was not due to a greater decline in B-cell function [30, 31]. The animals of the present work were divided into 6 groups as: Group I: rats were fed with a standard diet (8% fat); Group II: rats were fed with standard diet and received CrPic; Group III: rats were fed with standard diet (8% fat) and received CrHis; Group IV (HFD/STZ) (rats were fed with a HFD (40% fat) for 2 weeks and then injected with STZ (40 mg/kg i.p. ); Group V (HFD/STZ + CrPic) (rats were fed with a high-fat diet (40% fat) for 2 weeks and then injected with STZ (40 mg/kg i.p.) and received CrPic; Group VI (HFD/STZ + CrHis) (rats were fed a high-fat diet (40% fat) for 2 weeks and then injected with STZ (40 mg/kg i.p.) and received CrHis. CrHis and CrPic were included into water and administered at a concentration of 22 μg CrPic and CrHis 12 weeks. Before STZ injection, glucose concentrations of rats were measured and compared to controls. After STZ injection, animals exhibiting fasting glucose levels > 140 mg/dl were considered as STZ diabetic; resembling type-2 diabetes in human. CrPic and CrHis were then administered. In all groups, rats were sacrificed by cervical dislocations and kidneys were promptly removed. Protein extraction was performed as follows. The sample was homogenized in ice-cold in 1 ml of hypotonic buffer A [10 mM HEPES (pH 7.8), 10 mM KCl, 2 mM MgCl2, 1 mM DTT, 0.1 mM EDTA, 0.1 mM phenylmethylsulfonyl-fluoride (PMSF)]. A solution of 80 μl of 10% Nonidet P-40 (NP-40) was added to the homogenates, and the mixture was centrifuged for 2 min at 14,000 g. The supernatant was collected as a cytosolic fraction for the assays of IκBα and 4- hydroxyl nonenal (4-HNE) adducts. The precipitated nuclei were washed once with 500 μl of buffer A plus 40 μl of 10% NP-40, centrifuged, resuspended in 200 μl of buffer C [50 mM HEPES (pH 7.8), 50 mM KCl, 300 mM NaCl, 0.1 mM EDTA, 1 mM DTT, 0.1 mM PMSF, 20% glycerol] and centrifuged for 5 min at 14,800 g. The supernatant containing nuclear proteins was collected for Nrf2 and NFκB p65 . Concentration of the protein was determined according to the procedure described by Lowry et al. using a protein assay kit supplied by Sigma, St. Louis, MO, USA. Sodium dodecyl sulfate-polyacrylamide gel electrophoresis sample buffer containing 2% β-mercaptoethanol was added to the supernatant. Equal amounts of protein (50 μg) were electrophoresed and subsequently transferred to nitrocellulose membranes (Schleicher and Schuell Inc., Keene, NH, USA). Nitrocellulose blots were washed twice for 5 min each in PBS and blocked with 1% bovine serum albumin in PBS in room temperature for 1 h prior to application of the primary antibody. The antibody against Nrf2 and 4-HNE adducts were the purchased from Santa Cruz Biotechnology, Inc. (Santa Cruz, CA, USA) and from 4 Alpha Diagnostics (San Antonio, TX) respetively. Antibody against IκBa and NF-κB p65 were purchased from Abcam (Cambridge, UK). Primary antibody was diluted (1:1000) in the same buffer containing 0.05% Tween-20. The nitrocellulose membrane was incubated overnight at 4°C with protein antibody. The blots were washed and incubated with horseradish peroxidase-conjugated goat anti-mouse IgG (Abcam, Cambridge, UK). Specific binding was detected using diaminobenzidine and H2O2 as substrates. Protein loading was controlled using a monoclonal mouse antibody against β-actin antibody (A5316; Sigma). Blots were performed at least three times to confirm the data reproducibility. Bands were analyzed densitometrically using an image analysis system (Image J; National Institute of Health, Bethesda, USA). Sample size was calculated based on a power of 85% and a P value of 0.05. Given that assumption, a sample size of 10 rats per treatment was calculated. The data were analyzed using the General Linear Model (GLM) procedure of SAS software . Least square treatments were compared if a significant F statistic (5% level of P) was detected by analysis of variance. Treatments were also compared using student's unpaired t test for comparison of individual treatment. P < 0.05 was considered to be statistically significant. Between group differences in latencies were analyzed by the analysis of variance for repeated measurements (ANOVAR) followed by Fisher's post hoc test for all groups. Figure 1 shows the effects of CrPic and CrHis on NF-κβ, IκBα, Nrf2 levels and 4-HNE protein adducts of kidney in rats. In this study (Figure 1A), the kidney NF-κβ p65 subunit level increased significantly in STZ and HFD groups. After oral administration of CrPic and CrHis, kidney NF-κB level was not altered in rats fed a regular diet, but significantly decreased in diabetic rats. When Cr was supplemented as CrHis, compared to CrPic, there was a greater decrease (P < 0.05) in kidney NF-κB level in diabetic rats. Renal IκBα level assessed by Western blotting and were significantly decreased in diabetic rats compared with those in control rats (P < 0.05), where as CrPic- and CrHis treatment significantly offset these increases in diabetic rats (P < 0.01) (Figure 1B). In diabetic animals the level of IκBα was significantly increased by CrHis as compared to the similarly treated CrPic groups. The protein levels of Nrf2 in the renal tissues were also determined by Western blot analysis (Figure 1C). Based on the band densities, renal Nrf2 level was significantly decreased in diabetic rats compared with the control rats. However, these decreases were partially compensated by the supplements of CrPic and CrHis. Compared to CrPic, CrHis is more effective in increasing these proteins. When Cr was supplemented in CrHis form, compared to its CrPic form, there was a greater increase (P < 0.05) in kidney Nrf2 level in diabetic rats. However, level of these proteins in kidney was not affected by CrPic and CrHis supplementation in control rats fed a normal diet. The kidney 4-HNE protein adducts increased significantly in STZ and HFD groups. After oral administration of CrPic and CrHis, kidney 4-HNE protein adducts were not altered in rats fed regular diet, but were significantly decreased in diabetic rats (Figure 1D). Taken all together, CrPic and CrHis effects were similar when rats fed normal diet, but CrHis was superior to CrHis, as reflected by a greater reduction in NF-κB levels and 4-HNE protein adducts and greater increases in the levels of IκBα and Nrf2 in diabetic rats. Western blot analysis of NF-κBp65, IκB, Nrf2 and 4-HNE protein adducts in kidney homogenates of controls and chromium-treated rats. Densitometric analyses of these bands are represented as percent of control. Values are means ± standard error of the mean. Blots were repeated at least 3 times (n = 3) and a representative blot is shown. Actin was included to ensure equal protein loading. Data points with different superscripts are significantly different at the level of P < 0.05 by Fisher's comparison test. Control: no treatment; CrPic: Fed with standard diet and received CrPic; C + CrHis: fed with standard diet (8% fat) and received CrHis; HFD + STZ: received a HFD (40% fat) for 2 weeks and then were injected with streptozotocin (STZ) on day 14 (STZ,40 mg/kg i.p); HFD + STZ + CrPic: Treated with HFD/STZ but supplemented with CrPic. HFD + STZ + CrHis: Treated with HFD/STZ but supplemented CrHis. The mean bars with different letters differ (P < 0.05). Chromium supplementation as chromium chloride (CrCl3) [35, 36], chromium niacinate (Cr-N), CrPic  and CrHis  has been shown to inhibit the increase in inflammatory markers and oxidative stress levels in cultured monocytes exposed to high glucose levels. However, no research was reported in the literature for the effects of CrPic and CrHis supplementation on the kidney levels of NFκB, IκBα, Nrf2 and 4-HNE protein adducts in an animal model of diabetes. The results of the present work showed that CrPic and CrHis decreased NF-κB level in kidney of the rats with HFD/STZ-induced diabetes, indicating that CrPic and CrHis decreases 4-HNE protein adducts via the Nrf2/ARE-mediated pathway. In parallel with the results of the present work, Kuhad et al. reported that NFκβ p65 subunit was significantly elevated in the kidneys of diabetic animals. These results are consistent with previous studies showing that CrPic supplementation improves renal function in STZ-diabetic rats [39, 40]. Similar to the results of the present work, other reports have shown that diabetes causes alterations in the synthesis or concentrations of cytokines [36, 37, 41]. Chen et al. showed that the levels of NF-κB p65 in kidneys were distinctly increased in lower dose STZ-induced diabetic rat model fed with a high-fat diet. In addition, Bi et al. reported that insulin treatment inhibits liver NF-κB activity and inflammatory cytokine responses involved in the amelioration of insulin resistance in diabetic rats. Jain et al. reported that Cr-N supplementation lowered the blood levels of tumor necrosis-α (TNF-α), Interleukin -6 (IL-6), c-reactive protein (CRP) and cholesterol, In addition CrPic supplementation caused a decrease in TNF-α, IL-6 and lipid peroxidation in rats . Nrf2 controls the antioxidant response element (ARE)-dependent gene regulation in response to oxidative stress and contributes to protection against to the disorders related to oxidative stress [43, 44]. In the present work, Nrf2 levels in the HFD/STZ-induced kidney injury group was lower than those of controls, whereas CrPic and CrHis treatment induced level of Nrf2 and enhanced nuclear translocation and subsequent ARE binding (Figure 1C). This finding shows that CrHis and CrPic may be involved in stabilization and maintaining levels of Nrf2. 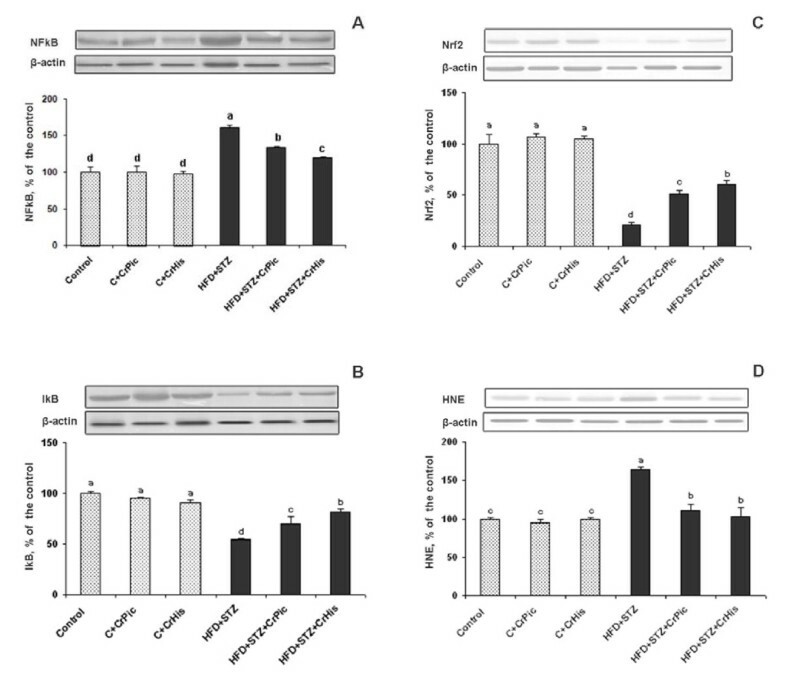 Palsamy and Subramanian  reported that during hyperglycemia-mediated oxidative stress, the expression of Nrf2 and its downregulatory enzymes like heme oxygenase- 1 were significantly decreased in the renal tissues of diabetic rats. CrHis was shown to reverse the deficits associated with obesity via up regulating the expression of Nrf2 and HO-1 in the rats fed HFD . However, there are no previous studies investigating the effects of Cr supplementation on the Nrf2 in diabetic nephropathy comparable with this study. Oxidative stress associated with overproduction of ROS plays an important role in the development of diabetic complications including diabetic nephropathy . These modifications can cause some morphological and functional disorders in the kidney of diabetic patients. The reaction of ROS with membrane lipids causes the formation of lipid peroxidation products including several aldehydic compounds, one of which is highly toxic and called as 4- HNE adducts. 4-HNE adducts, an indicator of lipid peroxidation, in kidney of diabetic rats were decreased when dietary CrHis or CrPic was supplemented. CrHis supplementation did not alter these parameters in non-diabetic rats. The current study appears to be the first to examine the specific association between dietary CrPic/CrHis intake and 4-HNE in diabetic rats. Significantly lower levels of 4- HNE adduct were observed in diabetic animals receiving Cr supplementation. These findings indicate significant positive associations between Cr intake and 4- HNE adducts for diabetic rats. These results confirm previous findings that the level of HNE is altered in diabetes, resulting in increased susceptibility of the tissues to injury . CrHis [22, 46] and CrPic , playing an important role against insulin resistance, is postulated to augment antioxidant defense system. Previous studies have also demonstrated that CrCl3 supplementation inhibited the increase in TNF-α and oxidative stress levels in cultured monocytes exposed to high glucose levels [35, 36]. Similarly, Jain et al. reported that CrPic supplementation showed a decrease in lipid peroxidation, TNF-α, IL-6 in rats. Preuss et al. also reported a decrease in hepatic thiobarbituric acid-reactive substances (TBARS) formation by supplementation of CrPic and Cr nicotinate in rats. The results of this study provide further evidence that CrPic and CrHis may have a protective role against diabetic nephropathy through the Nrf2 pathway and also through an anti-inflammation effect by NF-κB inhibition. Moreover, a greater reduction in NF-κB level and greater increases in the levels of IκBα and Nrf2 in diabetic rats supplemented with CrHis than rats supplemented with CrPic suggest that CrHis has more favorable effects than CrPic. The study was funded by Nutrition 21, Inc., NY, USA. Nutrition 21 also supplied the chromium picolinate and histidinate used in the study. James Komorowski is an employee of Nutrition 21, the distributors of chromium picolinate and histidinate under a license from the USDA. MYS, ZT and FA participated in data collection and laboratory analyses and assisted in every aspect of the study. BA and AD participated in study design and data interpretation and wrote the first draft of the manuscript. JRK and MA contributed to the study design, interpretation and preparation of the manuscript. KS participated in organization of the study and data interpretation and preparation of the manuscript. All authors read and approved the final manuscript.